Cards by Jessi: Let's hear it for the boy! 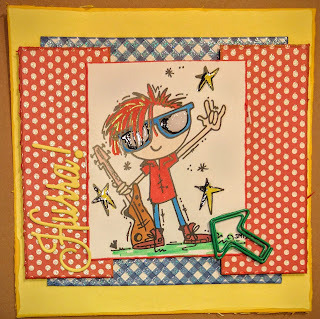 My rocker participates in these challenges: Sketch Saturday, The Paper Shelter (Music and Dance), Lil' Patch (ATG), Penny's (ATG), Inspiration Destination (ATG) and Cute Card Thursday (ATG). Awesome card and fun image. Thanks for sharing over at Inspiration Destination. Loving the arrow and the sentiment is so perfect with this image. a fabulous creation. Thank you so much for sharing it with us at Lil Patch of Crafty Friends #43 Anything Goes Challenge.